The number of fatalities in crashes involving teen-age drivers spiked nearly 10% last year as teens were often speeding or distracted by cell phones or other passengers, according to a pair of safety studies released Wednesday. The spike comes after a decade when the number of people killed was cut nearly in half. Teens were involved in 14,000 fatal crashes during the last five years, with nearly one-third involving speeding, according to AAA automobile club. The number of people killed in those crashes jumped to 4,689 last year, from 4,272 in 2014, according to a report from the Governors Highway Safety Association funded by Ford Motor Co. The number of fatalities had been dropping steadily from 8,241 in 2005, according to the report based on figures from the National Highway Traffic Safety Administration (NHTSA). Teens are 1.6 times more likely to be involved in fatal crashes than adults, according to the report. The crashes involved teen drivers, but the fatalities could have been a passenger, somebody in another car, a bicyclist or pedestrian. "This report drives home the message that there is still much to do to reduce teen driver fatal crashes and the resulting deaths," said Jonathan Adkins, executive director of the governors group. Pam Fischer, the consultant who wrote the report, said a three-stage licensing program is in place in all 50 states, which reduces the risks of crashes involving teenagers 30%. but an estimated one in three teens doesn't get a license by 18, when the programs end, despite the continued high risk of crashes. 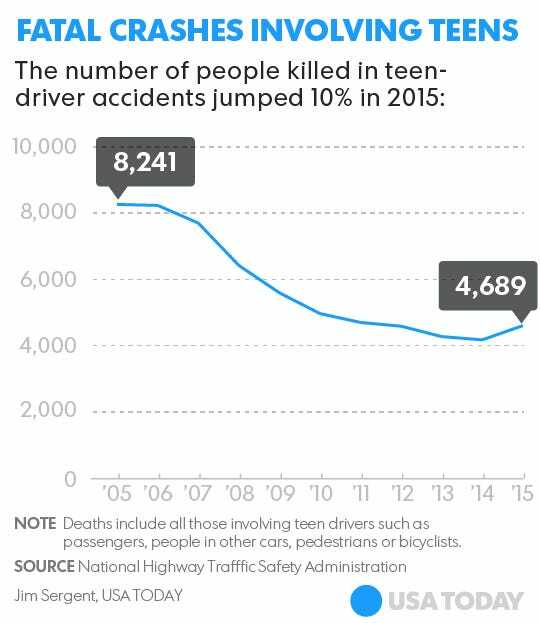 The number of teen drivers who die in crashes increased steadily with age. During the past decade, 39 drivers died at 15 years old, according to a May report from NHTSA. The numbers swelled to 472 drivers who died at 19 years old, according to NHTSA. "Policy-makers need to understand that reaching age 18 doesn't necessarily equate to mental maturity, which is critical for safe driving," Fischer said. Bill Van Tassel, AAA’s manager of driver training operations, said parents can help save lives by coaching teens to slow down and avoid common mistakes like becoming distracted. “Nearly two-thirds of people injured or killed in a crash involving a teen driver are people other than the teen,” he said. An August survey of 142 driving instructors revealed speeding, distraction by talking on a cell phone or with other passengers, and poor scanning of the road were the three top mistakes teens make while learning to drive, according to AAA. To reduce those risks, AAA recommends at least 50 hours of practice driving for teens, only one non-family passenger riding along during the first six months with a license and a ban of wireless devices in the car. Adults sometimes set a bad example. Another AAA survey found 77% of drivers aged 35 to 55 reported talking on cell phones while driving, compared to 68% of teenagers. Nearly half of each age group reported speeding at least 15 mph over the limit on freeways.